A herpes virus that lies dormant in many people can hinder the repair of the neuron-protecting myelin sheath whose deterioration causes MS, a study reports. The finding about the HHV-6 virus may help explain differences in the symptoms and progression of the disease from person to person, researchers said. HHV-6 is one of the most common human herpes viruses, infecting an estimated 80 percent of people during childhood. About 1 percent of the population has congenital HHV-6, meaning they inherited it from their fathers or mothers. Some people with the virus display mild symptoms, including fever and rash, which their immune systems fight. But in many cases, HHV-6 goes unnoticed. That’s because it produces a protein known as U94 that prevents the immune system from detecting it. Whether a person with the virus is exhibiting symptoms or not, it is never destroyed, meaning that it can reactivated later on. Some research has suggested that viruses can impair myelin repair and thus play a role in the development of MS. 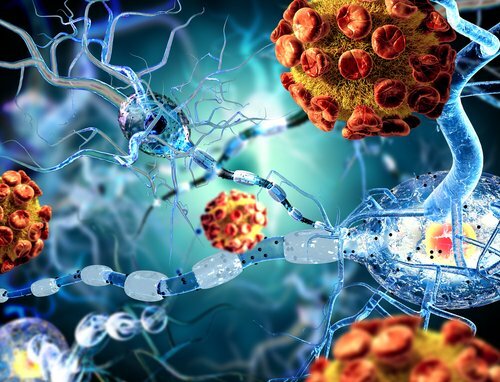 In one study, scientists found HHV-6 genetic information in the neurons of people with severe forms of MS.
Other studies have concluded that HHV-6 was an unlikely cause of the disease, however. “While latent HHV-6 – which can be found in cells throughout the brain – has been associated with demyelinating disorders like MS, it has not been clear what role, if any, it plays in these diseases,” Dr. Margot Mayer-Proschel, an associate professor at the University of Rochester Medical Center Department of Biomedical Genetics, said in a news release. She was the senior co-author of the Scientific Reports study. Mayer-Proschel’s team decided to see if HHV-6 could affect brain cells called oligodendrocyte progenitor cells that play a key role in providing myelin to neurons. When disease, an injury or age causes myelin loss, the progenitor cells, also known as OPCs, migrate to the place that needs repaired. There they mature into myelin-producing cells called oligodendrocytes to fix the damage. The researchers discovered that OPCs containing the U94 viral protein were unable to migrate to the places that needed myelin restored. “These findings show that, while in the process of hiding from the immune system, the virus produces a protein that has the potential to impair the normal ability of cells in the brain to repair damaged myelin,” Mayer-Proschel said. Although the research suggested that HHV-6 might contribute to myelin loss, it did not make clear whether the virus can influence the severity of myelin-loss diseases, including MS. It also did not make clear whether those with congenital HHV-6 may be at risk of developing such a disease.